What would you rather do? Peer down into a canyon from the rim drive or venture inside? If you chose being in the canyon, then we recommend exploring Canyon de Chelly by four-wheel-drive. For an introduction to off-roading, Canyon de Chelly National Monument near Chinlé, Arizona, offers baby boomers easy to moderate driving challenges in a scenic setting. History whispers from ancient cliff dwellings as you bounce along the canyon floor next to the streaked, pink walls of sandstone cliffs. But life still goes on here as sheep graze beside hogans in this canyon that the Navajo call their summer home. A two-day discovery of Canyon de Chelly and her sister, Canyon del Muerto, initiated me to the ranks of four-wheel-drive enthusiasts—Alan is already an expert. Accompanied by Navajo guide, Delbert Wilson, our group of 4 jeeps learned about the canyon’s spiritual and cultural significance as the vehicles swayed up the muddy bank of yet another creek crossing. At sites like White House Ruins, Spider Rock and Mummy’s Cave, we stopped to explore while Delbert told us stories about his ancestors. Part of a Jeep Jamboree USA tour, the experience reminded me of a cruise on land as we shared the canyon with 50 Jeeps. Don’t have a Jeep? Buy a ticket for one of the large open vehicles that Alan and I fondly call “shake and bakes” or book a private four-wheel-drive excursion operated by one of the Navajo licensed guide companies. Outfitters also offer hiking, camping and horseback riding adventures in the canyon. 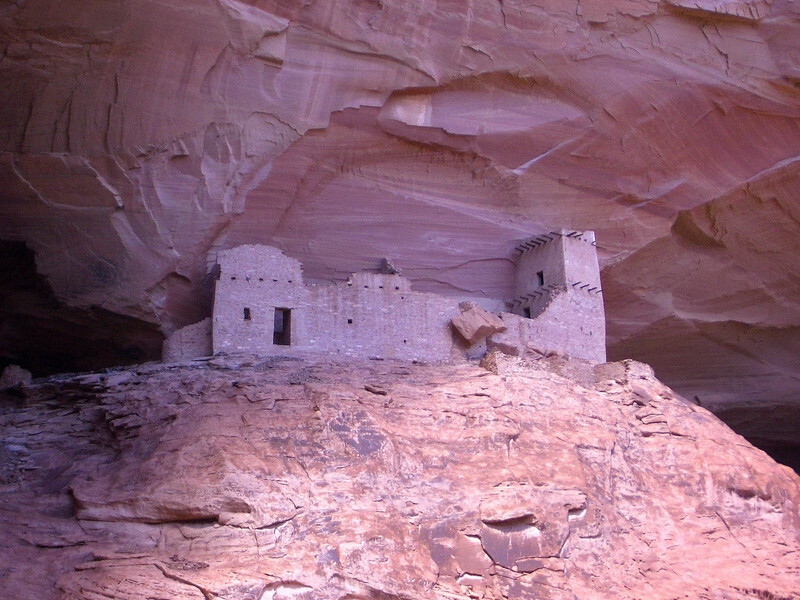 Drives on the north and south rim of Canyon de Chelly do not require a guide or permit. A trail also leads from a parking area on the south rim down the canyon wall to White House Ruins. But don’t miss all the fun. You need to travel into the canyon to truly experience it. 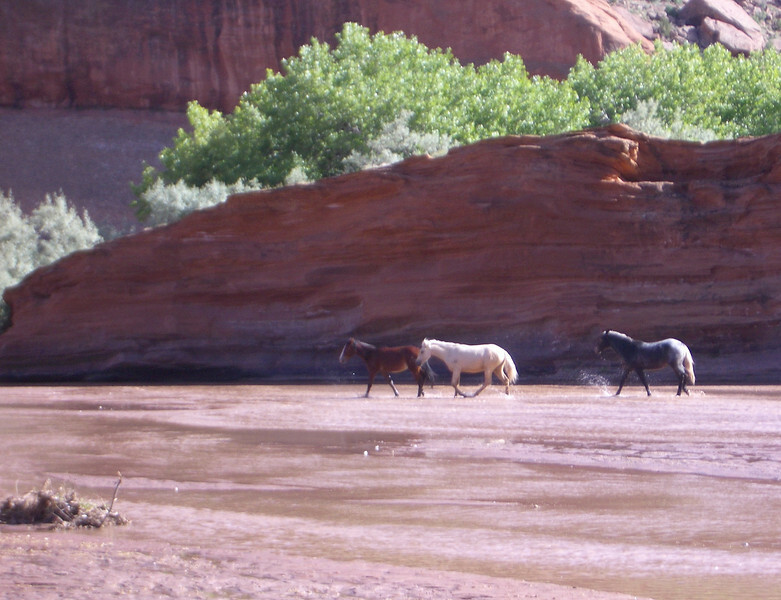 As we left Canyon de Chelly, I spotted horses running free in Chinlé Wash. The splash from their hooves hovered in the air like crystal jewels lit by a late afternoon sun. Don’t miss this off-the-beaten-path Arizona travel experience. Start your travel planning with us for where to stay in Chinle. Have you explored Canyon de Chelly? Join the conversation at the My Itchy Travel Feet page on Facebook or send us an email.